Got some great info to share, a nearly complete dub cast list for the main cast for tri. part 1. We only have 2 cast members missing thus far... so here is the list. Didn't have to dig to hard to get everyone and confirmation. Hopefully we get confirmation on Tai and Biyomon soon. Shockingly most of the cast is back. Kyle Hebert is new as Greymon in Adventure, but he's been Belphemon in Data Squad, and in Fusion he was Dorulumon, Ballistamon, and Greymon (and Beelzemon in the Data Squad game.) He is probably best known as the narrator and older Gohan in Dragon Ball Z.
Vic Mignogna is our new Matt. He was Kiriha/Christopher and MadLeomon in Fusion. As for his best known role, it'd probably be Edward Elric in both Fullmetal Alchemist series'. Robbie Daymond is our new Joe. He is new to Digimon. His biggest role thus far is likely Mamoru/Tuxedo Mask in the new Sailor Moon dub. Johnny Yong Bosch we already knew would be our new TK. He isn't new to Digimon, his biggest role likely being the bit part of Dracomon from Fusion. His biggest roles people would know would probably be Adam from Power Rangers, Vash from Trigun, or roles to numerous to list. Tara Sands is our new Kari. She is new to Digimon. Her best known roles would likely be Mokuba Kaiba from Yu-Gi-Oh or Bulbasaur from Pokemon. We knew Kate Higgins was Meicoomon, but it turns out she is also our new Gatomon and will be Himekawa also. She was Miki in Digimon Data Squad, but is probably best known as Sakura in Naruto. And while Doug Erholtz isn't back as TK, we now know he is doing the voice of Daigo. Outside of TK, his best known role is likely Gin Ichimaru in Bleach. About a week and a half until we get details on what theaters it will be playing in. Prior tri. part 1 dub and theater thread is here. Update- Thanks to AmEv7Fam for pointing out Eleven Arts posted their 'week 2' cast update and it matches the cast members on our list. Update- Dorothy Fahn mentions on her Twitter that she is voicing Tai and Kari's mom again. Thanks to C-MC for pointing me in the right direction. Update- Eleven Arts posted their 'week 3' cast update and it once again, matches our list exactly. so Vic is gonna be Matt? i dunno how to feel about that. i mean, i love Vic's work... i just don't think his voice will work with the character. i'm loving the idea of Kate Higgins as Gatomon. I am SO happy that Klein is returning as Gomamon, i can't hear any voice out of Gomamon than his. i'm not familiar with Tara Sands, but i'll definately miss Lara as Kari. Fingers crossed for Joshua Seth as Tai. Last edited by Rika24; 07-18-2016 at 07:58 PM. A Pokemon voice actor in Digimon? Well that's pretty cool. Last edited by Vice; 07-18-2016 at 08:29 PM. I updated the info with roles and info on the 'new' actors. We should be due tomorrow for more official cast list. In some ways, I hope it matches up. Of course Tai isn't confirmed yet. I'm sure it's no surprise on anyone's end, but good to know there'll be some kind of consistency by keeping "Tai" "Izzy" and all the other dub names. Totally confident that Vic can get across Matt's teenage try-hard swag juuuust right. I don't mind Joe and TK getting recast, either. Woulda really loved to have Kari's original English VA, since her voice is so distinguishable (and cute!) but I'm sure I'll live with her recast, too. I'm also reminded that I should get to checking out the dub track of my Time of Eden BD, if only to get a feel for what Tara Sands' voice is like outside of being Kaiba's kid brother. I'm confirming cast, not names used in show. The old characters 'do' appear to have the same names for what it's worth. Tara Sands....was never a fan of her Mokuba Kaiba voice. Vic as Matt....as long as it's not Ed's voice like Kiriha ended up. I hope he will do a new voice tbh. Kate is rather busy lol. Hope voices don't cross over lol. Otherwise glad to see other returnees, disappointed in some mind you. I hope he can deepen his voice enough since Matt's voice was more on the deeper end than the voice that Vic does most often with his voice roles. Oh snap, that's an awesome casting choice! Although, personally, I would have swapped Vic and Robbie around to give them each other's role. Holy cow! Both of them came back! This'll be interesting since both of them had very distinctive voices in the dub. If I were to have recast Kari, I'd have gone with Sandy Fox instead. Personally, I'd wish these two would switch these two roles around between one another. I called it! I so called it! Man, this is exciting. Of course the Main Character with an Iconic voice has not been cast yet. Glad to see Tom Fahn back as Agumon! 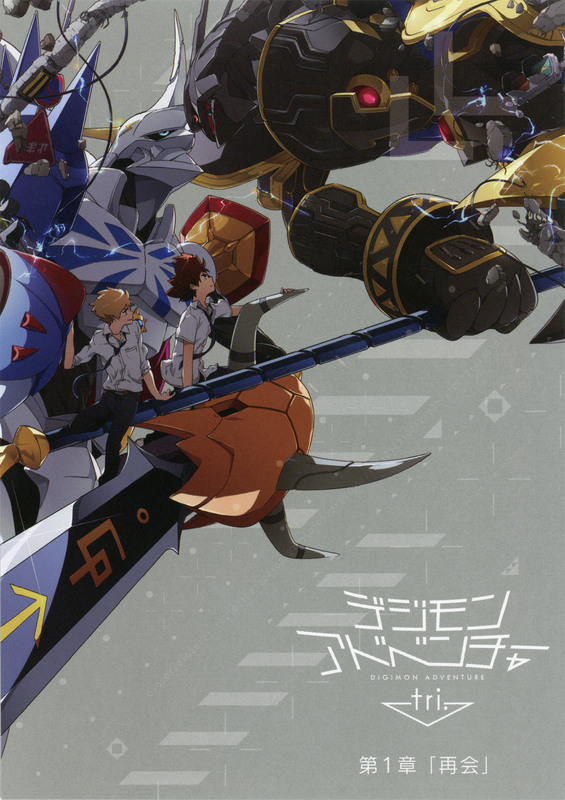 adventure tri., cast, digimon, tri.